Perfume equipment such as these have been used for distilling for many years at the Parfumerie Fragonard in the town of Grasse in Provence, France. 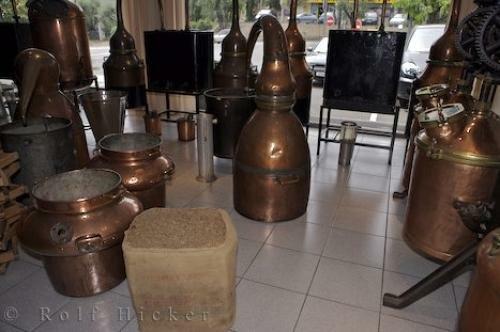 Photo of perfume distilling equipment at Fragonard Parfumerie in Grasse, Provence in France, Europe. ... An endless list of perfumes are on display at the Parfumerie Fragonard in Grasse.Distilling equipment at Fragonard Parfumeur, Perfumery in the town of Grasse, Provence, France, Europe. I photographed this photo with the digital SLR camera model Canon EOS-1Ds Mark II, aperture of f/5.0, exposure time of 1/60 sec. on ISO 100, as always I used a original Canon Lens, the focus lenght for this picture was 24mm.